Why It's Difficult To Find Full Video Of King's Historic Speech : The Two-Way Martin Luther King's "I Have a Dream" speech is copyrighted, limiting its presence online. One organization, however, has decided to provide ready access to the video. Civil rights leader Martin Luther King waves to supporters from the steps of the Lincoln Memorial on Aug. 28, 1963, in Washington. As thousands gather in Washington over the next week to the mark the 50th anniversary of the March on Washington, you may be moved to look for video of Martin Luther King Jr.'s "I Have a Dream Speech," which he delivered in front of the Lincoln Memorial during that march. It might surprise you that it is actually quite hard to find — because while many copies have been uploaded to Internet video sites, many have also been taken down. Why, you ask? It's all about copyright. 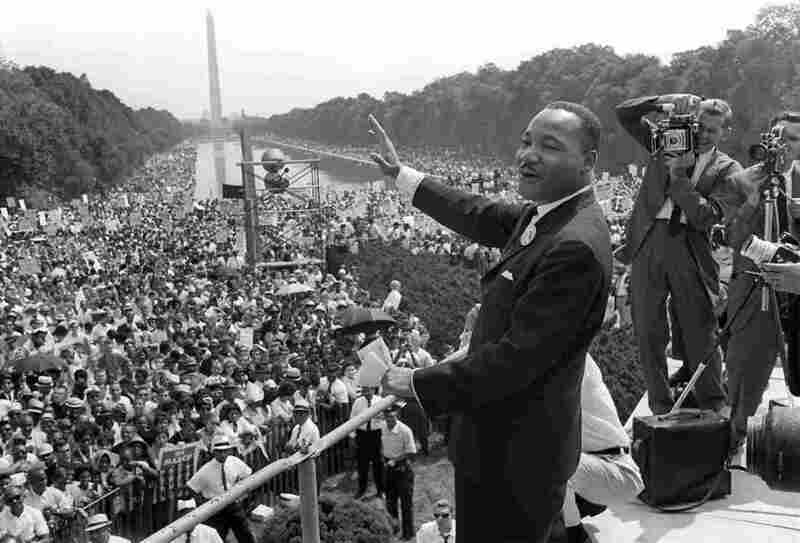 "Months after the August 1963 March on Washington, King himself sued to prevent the unauthorized sale of his speech, purportedly in an effort to control proceeds and use them to support the civil-rights movement. In 1999, the King family sued CBS after the network produced a video documentary that 'used, without authorization, portions of ... King's 'I Have a Dream' speech.' A divided Appellate Court, in reversing a lower court ruling, held that the speech was not a "general publication," despite its huge audience and subsequent historic importance. The speech instead qualified as a "limited publication," the court said, because "distribution to the news media, as opposed to the general public, for the purpose of enabling the reporting of a contemporary newsworthy event, is only a limited publication. "The ruling was narrow, and CBS and the King estate settled the case before the lower court could reconsider, leaving the copyright of the speech in a somewhat confusing legal situation. A CBS press release dated July 12, 2000, discusses the agreement that allowed the network to 'retain the right to use its footage of the speeches' from the march and license it to others in exchange for an undisclosed contribution to the Martin Luther King, Jr., Center for Nonviolent Social Change. "In 2009, EMI Publishing cut a deal with the King estate to help ensure that the speech was 'accorded the same protection and same right for compensation as other copyrights.' EMI was sold in 2011 to a consortium headed by Sony. The King Center did not respond to requests for comment." The bottom line is that online presence of the speech is likely to be problematic until 2038, when King's copyright expires. U.S. law states that an author keeps a copyright for life plus 70 years. All of that said, an activist organization called Fight for the Future has taken it upon itself to provide ready access to the speech. On Internet Freedom Day, the organization uploaded video of the entire 17-minute speech, which, at the moment, is still available on YouTube. Volz, by the way, will be on tonight's edition of All Things Considered to talk about his reporting. Click here for a NPR member station near you. We'll post audio of the interview a little later today.